Painters Need Not Apply. Industrial Flooring Professionals at Work! Epoxy was first used in the early 1950s for concrete restoration. Over the last couple of decades, epoxy painted floors have hit the mainstream consciousness and have become a preferred coating for residential garages. Home DIYers and commercial painters have begun applying what is colloquially known as epoxy paint. There is a vast difference between epoxy paint and a true industrial-strength epoxy coating, however. The main difference is in the quality and durability of the materials as well as the skill required to successfully install the product. Common household epoxy paint is good only for light-duty applications and was never intended for industrial use. It is manufactured with a long pot life for easier application. Products like this may perform beautifully for light-traffic, residential use but are not strong or durable enough for industrial use. The true industrial solution is a floor coating that is specifically designed for your use. Whether you are processing food or chemicals, manufacturing electronics or pharmaceuticals, or need a floor coating for an aircraft hangar, there is a wide range of specialty epoxy coatings for your needs. Your professional floor coating installer can design your epoxy floor to be skid resistant, hygienic, electrostatic dissipative and conductive, and much more, depending upon your requirements. However, epoxy floor coatings are much more difficult to install than home DIY kits and require a professional coatings installer with experience in the industry. Most industrial coatings products are 100% solids and are a multi-component resin system with a short pot life. This means that they require a skilled hand during the floor preparation, mixing and application process. The end result is a seamless floor that performs beautifully and is hygienic, durable and easy to clean. What is the Difference Between Floor Paint and Floor Coating? Epoxy paint is essentially latex paint with a small amount of added epoxy for increased durability. This type of product is best left for DIY home garage projects and is never an appropriate choice in industrial settings. Epoxy floor coating is a much more technical process that requires the expertise of a flooring professional to properly install. The exact materials used vary depending on the type of flooring system required, but every floor system installation requires careful planning to ensure the essential performance characteristics are achieved with the finished floor. 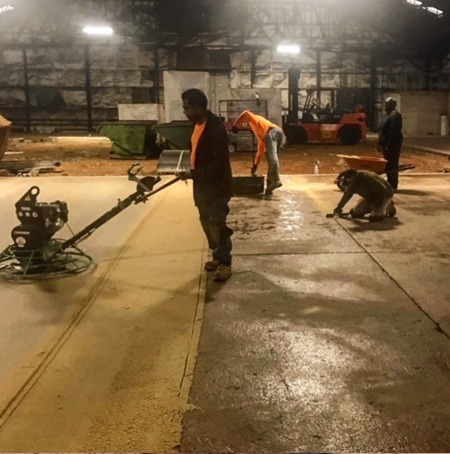 Floor coating systems require the proper preparation of the underlying concrete and subsequent layers to ensure the products bond correctly and the coating is successful. Floor coating systems are used in an array of industry facilities including chemical processing, food processing, electronics, aviation, pharmaceuticals, and warehousing. These systems protect concrete floors as well as products in the facility and provide a safe working environment for staff. They are seamless, easy to clean and non-toxic. High-gloss flooring options can even save you money on your electric bill by reflecting light so that fewer indoor lights are needed. Epoxy – Epoxy is a resin comprised of 1-part epoxide resin and 1-part polyamine hardener. In the application process the epoxy is left to cure for a minimum of 24 hours. When cured, it produces polymer structures that give the substance great strength and durability. This type of floor coating is non-porous and is used in high impact facilities where optimum durability is the top priority. Highly resistant to chemical spills and abrasion, these systems are often used with decorative chips or colored sands. We can achieve an infinite array of color schemes or patterns with this material. Epoxy & Urethane – Epoxy and urethane floors have an added top layer of urethane that acts as a seal and provides a seamless surface that is moisture and heat resistant. Epoxy & urethane floor systems are commonly found in the food and beverage industry. Acrylic (MMA) – MMA is a dual system polymer that is not as hard or durable as epoxy but is a formidable option for commercial flooring. MMA has a low glare satin finish and is resistant to weak acids, alkalis, solvents and scratches. It is also highly flammable and odorous, so special ventilation and installation procedures must be implemented. Polyurea – Polyurea is an organic polymer that is the result of a reaction from mixing an isocyanate and resin blend component. Polyurea has a rubber-like feel, making it not as hard as epoxy but still extremely durable. Polyurea flooring has a high-gloss finish, is highly stain and chemical resistant, and has a high heat tolerance. Surface Technology is the nationwide leader in providing flooring solutions for industrial customers. We work closely with you to determine the needs of your facility and create a flooring solution that is tailored to your company’s needs. We are fully aware of the regulatory and industrial standards in place across the USA and ensure full compliance with those standards. Our work is noted for its quality and durability, and we are respected for our unique ability to respond and install industrial floors on short notice. Our teams of trained and well-equipped installers are available to work during holiday periods when facilities are in a planned shutdown period. When it is time to think about a new flooring system for your industrial facility, call Surface Technology. We are a trusted and respected contractor that specializes in the custom design and installation of industrial floors for industrial facilities. We guarantee that we will provide the right floor for your needs.